Systems dominated by heterogeneity over a multiplicity of scales, like porous media, still challenge our modeling efforts. 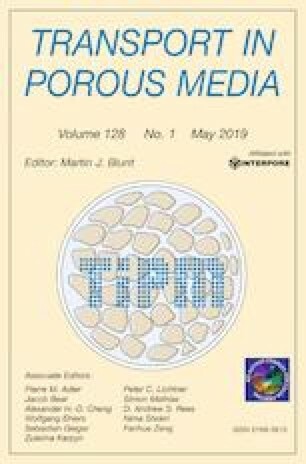 The presence of disparate length- and time-scales that control dynamical processes in porous media hinders not only models predictive capabilities, but also their computational efficiency. Macrosopic models, i.e., averaged representations of pore-scale processes, are computationally efficient alternatives to microscale models in the study of transport phenomena in porous media at the system, field or device scale (i.e., at a scale much larger than a characteristic pore size). We present an overview of common upscaling methods used to formally derive macroscale equations from pore-scale (mass, momentum and energy) conservation laws. This review includes the volume averaging method, mixture theory, thermodynamically constrained averaging, homogenization, and renormalization group techniques. We apply these methods to a number of specific problems ranging from food processing to human bronchial system, and from diffusion to multiphase flow, to demonstrate the methods generality and flexibility in handling different applications. The primary intent of such an overview is not to provide a thorough review of all currently available upscaling techniques, nor a complete mathematical treatment of the ones presented, but rather a primer on some of the tools available for upscaling, the basic principles they are based upon, and their specific advantages and drawbacks, so to guide the reader in the choice of the most appropriate method for particular applications and of the most relevant technical literature. The work of IB was fully supported by the Department of Energy under the Early Career Award DE-SC0014227953 “Multiscale dynamics of reactive fronts in the subsurface.” The work of DO was supported by the Laboratory Directed Research and Development program of Los Alamos National Laboratory under Project Number 20180481ER. The work of CTM was supported by Army Research Office Grant W911NF-14-1-02877 and National Science Foundation Grants 1619767 and 1604314. The work of PST was supported by the National Science Foundation award 0756762, and USDA-NIFA awards 2009- 35503-05279 and 2003- 3550-13963/TEXR-2006-03846. BDW was supported in part by NSF award EAR 1521441. The authors are listed in alphabetical order. IB led the effort, conceptualized the analysis, organized the entire manuscript, reviewed the homogenization method and integrated all the contributions by the other co-authors; DO reviewed renormalization group theory; CTM and FJV-P provided the overview on the thermodynamically constrained averaging theory; PST reviewed hybrid mixture theory; BDW and PTF-V provided the overview of the volume averaging method. All authors have reviewed and provided feedbacks on the manuscript structure and content. reaction rate of the backward homogeneous reaction \(A+B \leftarrow C\).